As a fan of Community, I feel like it’s my personal duty to introduce everyone and their cousin and their cousin’s sister’s hairdresser to this underrated and underappreciated show. I have three friends who are currently watching the series with me (all three in different seasons, mind you). When my best friend and I finished this episode, all she could say was: “… wow. Jeff was harsh.” And, to be honest, I hadn’t seriously contemplated exactly how cruel Jeff had really come across in “Anthropology 101” until I re-watched the episode with her. It is strange to read through the reviews of the last three episodes of season 1, to hear how much I praised Jeff Winger’s character growth… only to realize that, at the start of the second season, he was back to square one. It’s important, however, to recognize the significant developments that occurred between the end of “Pascal’s Triangle Revisited” and the beginning of “Anthropology 101.” At the end of the first season, Jeff had admitted that he wasn’t exactly sure whether or not he could evolve or know what he was, or who he was as a person. And he discussed this dilemma freely with Annie – he was open and honest with her about his insecurities and his heart. But then they kissed and it’s likely that both of them didn’t know what it meant or how to proceed. Evidently, Jeff had a conversation with Annie involving discretion on their part. There’s no need to be discreet about something unless there is something to be discreet about (just saying). Nevertheless, “Anthropology 101” kicks off the sophomore year by examining the deepest flaws in each of these characters, and exploring what happens when selfishness and competition alone propel a group of individuals. Where it leads them, of course, is into sheer chaos and dissension. The instigators of this chaos are many, the prime ones – of course – being Jeff and Britta. In our previous character studies, we’ve recognized that Britta is (and has always been) insecure around women, and this episode finds her being popular in their eyes, because she “put her heart on the line,” like so many heroines in chick flicks do, only to be jilted by Jeff Winger. Both Jeff and Britta are selfish characters, and both are very proud. In spite of how much he has grown, Jeff remains unapologetic for the events in “Pascal’s Triangle Revisited,” and truly in his relationships with Annie and Britta in this episode (and every other character… Jeff is kind of a tool in “Anthropology 101”…), the lines he uses (“You embarrassed me that night, too” and “My stock around here is kind of plummeting” and “Every woman deserves to be with me,” etc.) indicate that his main concern is “fixing” things he has broken, not by owning up to his mistakes, but by making others apologize. Britta isn’t the only woman who is jilted by Jeff’s pride, of course. Annie too is brushed aside by him throughout the episode and dismissed as “a mistake,” when clearly there were more feelings and emotions involved at the end of “Pascal’s Triangle Revisited,” solely based on the pre-kiss conversation alone. But Jeff isn’t the guy who desires to make right in this episode – he is the one who desires to WIN. And thus, he and Britta compete to see who can remain the last person standing. They play emotional chicken with one another, using their newfound power and social standing to claim a nonexistent trophy, and all because they are too proud to admit anything otherwise. Britta is intriguing in this episode because, while pride is a vice of hers, she allows power to dictate her actions. Ironically, she never chastises Jeff for the way that he acted at the dance until she learns of his kiss with Annie, but she reacts the very opposite way that Jeff did. While the aftermath of the confession provided Britta with power, and she used that power to her advantage, the presence of the confession elicited fear in Jeff in that moment, and he ran away. It’s something interesting, to compare and contrast Britta’s power with Jeff’s fear. I'll return to the other characters momentarily, but realize that I don't find anyone in the episode innocent -- each one of the members contributed in some way, shape, or form to their destruction. But before we get to that, we'll discuss the plot of the episode. It's the first day of a new school year, and the episode opens with each study group member's morning routine, ending with Britta who is lying in bed, seemingly about to have a panic attack due to the day ahead. For those who don't remember, "Pascal's Triangle Revisited" ended with both Britta and Slater publicly professing their love for Jeff in front of the entire school. Instead of choosing between the two of them, Jeff left the dance where he ran into Annie and discussed his dilemma. And, in the moments that followed, the pair ended up making out. I must say that I am quite proud of Britta (for a little bit, at least) in "Anthropology 101." She bravely walks into the school, knowing that she had embarrassed herself just a few months before. She remains tough. … until she gets embarrassed and runs away. But still, at least she showed up. That's more than most people would be able to do. She seemingly hides from girls who are gossiping about her while the rest of the study group enters campus. Pierce and Troy, as we learned from the first season's finale, are now living together and apparently Troy has created a Twitter account (@oldwhitemansays -- a parody of the "$#*! My Dad Says" account and show, for that matter) where he posts all of the offensive or absurd things that Pierce says. Annie and Abed walk in together, reading the account, and the entire group - sans Britta - meets up in the study room. They all hug, and when Annie maneuvers to hug Jeff, he looks at the group and pulls away. The first instance that Jeff is more concerned about his perception than how he affects anyone else is when he attempts to squirm his way out of a hug with Annie (but only once he throws a glance at the group). It isn’t a stretch that Jeff and Annie would hug (Jeff just hugged Shirley, Abed and Shirley hugged, etc. ), but Jeff cares more about himself and the way that he is perceived within the group (and outside of it, for that matter) than anyone’s feelings. At all. The group then wonders whether or not Britta will actually return to school, since she didn't seem to call or e-mail Shirley and Annie back after they had made efforts to that summer. When Troy begins to get emotional, the entire group lapses into silence until Pierce asks if everyone had seen Toy Story 3, and then all conversation about Britta is forgotten. Well, until she pops up from behind one of the study room couches. She apologizes to Jeff and admits that she was only trying to compete with Slater during the dance and that things got out of control. When Shirley says that Britta has no need to hide from the group, the blonde points outside of the door and notes that she isn't hiding from her friends, but from the gaggling groups of gossipy girls (how's THAT for alliteration?) that seem to be following her. This made me think that I really would like to see a flashback episode where we get to see each of the study group members pre-Greendale. I’d love to see what Britta had been like in high school. We get glimpses of her insecurity around other women (that comes into play in both “Football, Feminism and You” as well as “The Psychology of Letting Go”) because of how she had been treated as a teenager, but it would intrigue me to know the extent of it. I believe it’s because she was spurned by women that she ended up being more comfortable with men and thus the object of more attention from them, which then spurred the hatred of her by other women, etc. When Jeff speaks, it's not to accept Britta's apology or to apologize for running out on the dance, but rather to chastise her and let her know that he too was embarrassed, so the girls that are (seemingly) gossiping about her? Well, that's just karma. And I had to wonder exactly what Jeff’s deal is with his coolness toward Britta at the beginning of t his episode, but I think it boils down to his pride and ego. She handed him an apology, which he didn’t earn. At the dance, the final glance before he left between them seemed to form an understanding – an acknowledgement that he was sorry, but he couldn’t choose. And yet, in this season’s opener, Jeff is insisting that Britta embarrassed him at the dance. Jeff’s pride and ego had been ruined during those moments. But here is where he has lost sight of the grand picture: while he suffered momentarily, his actions caused Britta to suffer more long-term consequences (or so she thinks, anyway). And this seems to be something that Jeff can’t quite come to grasps with in the episode – that his actions don’t just affect HIM, but the people around him as well (and usually MORE than they affect him). When the study group decides to just walk to class and not discuss the transfer dance scenario further, Britta runs right into a group of girls who admit to idolizing her for speaking her heart. Just as Britta is about to correct them, one girl asks if the blonde would sign something for her, and Britta begins to realize that she MAY be able to reap benefits of her embarrassment. Jeff, overhearing, admits to himself that he doesn't like where that is going. Annie is just behind him, affirming his thought, but he steers her out of the middle of the hallway to discuss their kiss. During the summer, they apparently had a conversation about being discretion, which - like I mentioned earlier - there is really no need for, unless there's something to be discreet about. And I understand that he meant to be discreet about their kiss and to forget about it, but I'm wondering if there's something more that Jeff is just not saying at this point. Evidently, Jeff believes Annie to be a love-struck teenybopper (a theory she is not helping disprove by twirling her hair around her fingers and smiling) and reminds her that the "Pascal's Triangle Revisited" kiss was, in fact, a mistake. When Annie flounces away, Jeff watches her and mumbles: "I don't like where that's going." Nevertheless, he must catch up with her eventually, because Jeff and Annie walk into Anthropology together and encounter student!Chang, who is also taking that class. I think it’s sort of adorable that Chang takes notes throughout the class and actually has his book open before the class even starts. (As a note: this episode and “Applied Anthropology and the Culinary Arts” may be the only episodes in the second season where I actually really enjoyed Chang as a character). Once the class sits down, Abed explains to Jeff why exactly Britta has become a celebrity around women, and then the film student notes that he's going to try to make their sophomore year less relationship-driven, and more escapade-lead. Before Jeff can really grasp Abed's statements, Professor June Baur introduces herself to the class. 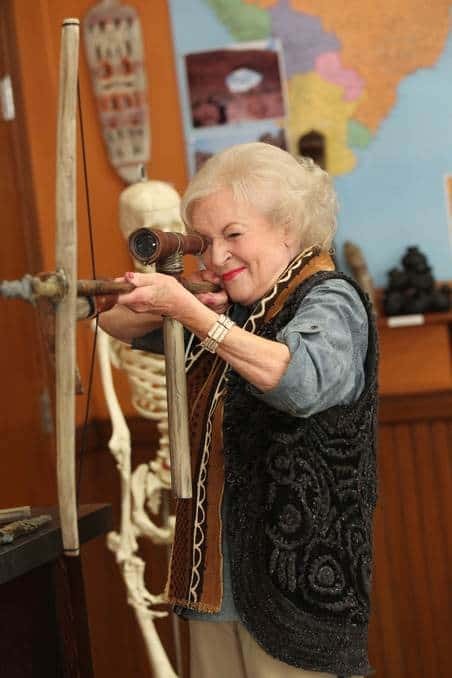 Now, I absolutely love Betty White and think she’s the cutest, but I have to admit that June is probably my least favorite professor at Greendale. Oh, wait. I just remembered that Slater is a professor. Nope, okay. Second least-favorite professor then. And it’s nothing really that Betty did, but… I don’t know. There was just something off, perhaps with the chemistry between her and the study group. That's just personal opinion, so feel free to disagree with me. At any rate, she assigns the group their first project -- they will be split into tribes of no more than eight people, and will be given a box of nine tools. Their job is to discover which of the tools in the box is the most powerful. Later, in the cafeteria, Jeff is approached by Chang, who subtly attempts to drop hints that he wants to be in their study group (and only joined so that he could do so). When the former lawyer attempts to order macaroni and cheese ("I DID eat all the macaroni. It's messed up he knows. "), the lunchlady slams the container shut and insists that the macaroni just walked out on him... like he did to Britta. I don’t think that Britta necessarily considers what her newfound fame is doing to Jeff until he confronts her in the cafeteria and points it out for himself. And the reason, again, that he points it out is not out of concern for Britta’s well-being, but for his OWN popularity’s sake. He spent a year building up a reputation around Greendale, and his perks are beginning to fade because of her. It’s then that Britta realizes she has the upper hand in their scenario – since SHE was jilted, she is the victim. But, instead of sucking up the few days or possibly weeks that he may have to endure until things “blow over,” Jeff decides to take matters into his own hands. If he can find a way to make Britta the jilter, his power returns back to him. As long as they both fight for their status and pride, neither loses. Again: emotional chicken. In Anthropology class, Jeff confronts Britta in front of the entire class and tells her that he loves her (to the utter dismay of Annie and joy of Shirley and the other women). And I love how utterly confused Britta is when Jeff says that he loves her, and also the fact that she turns around like she’s waiting to be Punk’d. But then, once it dawns on her that Jeff is attempting to take away her power from her so that he can retain his status, Britta gets (rightfully) angry. Because the only way now for her to keep her status is by returning Jeff’s confession and being “in love with him.” The moment that she begins to “love” him any less than he “loves” (loosely quoting, remember) her, she loses. And if there’s anything you should have retained from these 2,000 words so far it’s that both Britta and Jeff are prideful and competitive people. So he literally levels his gaze with hers and challenges her – she could set things back to right and admit (like she was about to do to her female groupies at the beginning of the episode) that she never actually loved Jeff, and was only competing against Slater. But she can’t do that. Britta likes the taste of power now. And she’s not about to give it back to Jeff to abuse again. Jeff and Britta then kiss and it looks like it was the most awkward thing in the world for Joel and Gillian to film (but it's hilarious in its awkwardness). Jeff appears to be taken aback by Britta’s compliance with this. I think he was actually expecting her to give up, because he studies her with doubt for a moment. Britta, of course, is unrelenting. And the pair continue to compete with one another throughout the day, kissing and listening to an iPod (sharing earbuds) to see exactly who will cave first. Annie remains distraught and disgusted, and she has reason to -- Jeff DID, after all, kiss her back at the dance (pretty desperately, might I add). She's not incorrect to assume that it would actually mean something. Shirley, meanwhile, is discussing with a disheartened Abed that relationships can be seen as adventures. From this point forward, control-oriented Abed takes charge. Back in the study room, the group is attempting to determine which of the nine tools is the most powerful (and Britta is playing with a funny little cootie catcher that has "Jeff" and little hearts written all over it), when Jeff comes in and kisses Britta. They both insist that they love each other and that they'd get married. When Abed hands Jeff and Britta the ring, you can see in their faces that they realize the competition could easily come to an end, so long as they each personally managed to grab the box first. If Britta grabbed it first, she knew she’d have the upper hand and that Jeff would have to say yes (and vice versa). Britta DOES manage to grab it first, and since Jeff will never relent to her in their game, he agrees to the "marriage" and kisses Britta. Shirley then reveals to the group that Jeff and Britta slept together during paintball. And then, everything comes out and it is honestly the most tense the study group has ever been and perhaps the most palpable tension I’ve felt watching a show. You can literally just feel yourself bristling at the remarks they fire back at one another in anger. Remember that I said earlier I would not consider anyone to be innocent in the group? The reason that I won’t pretend that anyone in this episode is guilt-less is because every character contributed to the group’s dissension somehow. Annie’s flaws (he insecurities and naïveté) cause her to react irrationally and immaturely – to punch Jeff in front of the group and then to blurt out that they had kissed (everyone immediately expresses their complete shock and a tense silence follows). Shirley’s flaws and Abed’s flaws are noticeably similar in this episode (and I actually didn’t realize that they provide a nice set-up for “Messianic Myths and Ancient Peoples” just a few episodes later), in that they both desire to control people and circumstances. Shirley is happy when she has an unrealistic sense of control in Jeff and Britta’s life – she loves when things and people react according to her plans. But she chastises Jeff when he acts outside of HER will and HER desires. Abed, in the same way, desires to control outcomes in order to make them the “best possible” versions that they can be (I use quotes because I use the term loosely). As we saw in “Virtual Systems Analysis,” control is an important thing for Abed and he never quite understands how to relinquish it, though at the end of this episode, he at least admits that he struggles with the issue. Pierce and Troy’s major contribution to the group dissension is the idea of immaturity – Annie is naïve (often to the point of delusion, but I think her character progresses significantly in season 3 in this regard), but Troy and Pierce are simply immature. Both of their intra-group spats have to do with feeling the need to prove themselves to the rest of the group and people outside of the group, at any cost. And that cost is often at the embarrassment of someone else. When Abed walks back into the room with a faux wedding party in tow, Troy reveals that the reason they are all tense and quiet is because Jeff made out with Annie. It intrigues me that Abed is actually surprised by the reveal of Jeff/Annie kissing. It doesn’t surprise me that Britta is upset, because I would probably expect her to be, even if she didn’t have any feelings for Jeff whatsoever (and of course, even more if she did). I think what stings the most though is Jeff telling Shirley that "men are monsters who crave young flesh" and was ashamed of the kiss with Annie (kissing is a two-way street, dude, and you definitely went for it the second time) and wanted to keep it a secret (re: “Conspiracy Theories and Interior Design.”) We’ll compare the carelessness with which Jeff dismisses Annie this episode with the face that he makes when we re-watch that episode later on! Abed asks where the two kissed, and Britta echoes his question. Annie is the one to own up to the kiss, and admits that it occurred after the transfer dance. This sets Britta off, (and again, I don't blame her) and she rounds on Jeff first and then Annie, snapping about how she "stole" Vaughn and then Jeff and how she "better not smile at that wall outlet or [Annie]'ll fry [her] tongue off!" And, though a hilarious line, this pretty much dissolves any hope of a Britta/Annie friendship in season 2. Troy is indignant and Jeff tries to pass the hot seat off to him by revealing to Pierce that Troy posts things on Twitter all day that the elderly man says. Pierce is upset by this and then Abed begins to gather his things and leave. Jeff snarks at Abed for not being able to discern life from television, and basically just tells the film student to grow up. Abed is silent for a moment before revealing that he DOES understand the difference between television and reality. "In life, we have this," he says. "We have you." And honestly, this is the ONLY person who actually affected Jeff in that entire conversation. It's the following day in Anthropology and the study group refuses to even sit together at the same tables. (Remember that one time in “The Science of Illusion” where Pierce wailed: “Let’s never let Jeff divide us again”? Whoops.) Jeff is forced to sit next to Starburns, who has heard about the group's falling out. After sleeping with Britta and making out with Annie what more could Jeff have POSSIBLY gotten out of the group anyway? And when Starburns makes his remark, I think something strikes a chord within Jeff – what more COULD he get out of the group? It’s something that, inherently, seems like a selfish question (because it is). Starburns recognizes that Jeff came into the group with the sole intention of getting something for himself. But what Jeff realizes is that it wasn’t really about what he could take from the group, but what they gave to each other. And in the sheer celebration of taking everything as a metaphor, if you combine all of the tools within the box (if you combine every member of the group and their pride, egos, and insecurities), you get a deadlier weapon than any one individually! But see, that's not the episode that Professor Baur was actually looking for -- when you combine all nine tools in the box, you get a deadly weapon resembling a crossbow. And she uses that to attack Jeff, who then passes out. Once he comes to, Jeff sees the entire study group standing around him. As it turns out, they all decided that Jeff had the right answer -- respect was something they all needed to focus on and remember. Annie admits that she thinks Jeff is gross (and Jeff says that's awesome, but I think it's used to show how self-deprecating he is because HE thinks he's gross -- he calls himself a "gross, jaded adult" in "Introduction to Political Science," and I think Annie's words struck a chord with him somewhere), and Abed apologizes for trying to control everyone when there was something great in front of them all along -- a crazy Anthropology professor. Chang approaches the group and asks if he can be let in, and the group says that they had been through a lot but that they'll think about it. In a surprising confession, Jeff admits that they'll let him in eventually (psychic, are we, Jeff? re: "Asian Population Studies"), because really... what CAN'T this group handle together? - They have a trapeze club at Greendale? I want to join! - Shirley’s little “Helloooo!” when Jeff wakes up is the most adorable thing ever. - The tag is reminiscent of the Spanish rap, and therefore my favorite.